Pete gets roped into trying to find a missing girl who used to sing at a local speakeasy. The only lead he has is that the girl was once involved with a local gangster, so finding her might not be the safest thing in the world to do. This one has a very high impact ending. And She Can Cook Too! As far as I know, Agatha Christie's Miss Marple is the first elderly spinster who turned out to have a talent for solving crimes. But Miss Marple's success opened the floodgates for a lot of imitators. The best of these might very well be a sharp-tongued school teacher named Hildegarde Withers. We first meet her in the 1931 novel The Penguin Pool Murder, written by Stuart Palmer. It would be the first of 18 novels and short story anthologies featuring Miss Withers. Acerbic she might be, but Miss Withers is (as mystery historian Otto Penzler states) "...a romantic at heart and will extend herself to help young lovers." This brings us to Edna May Oliver, a well-known character actor who specialized in playing shart-tongued spinsters. 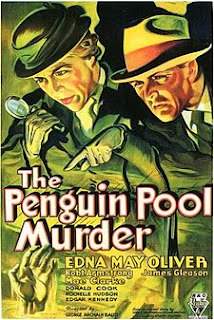 So when RKO adapted The Penguin Pool Murder into a film in 1932, Edna was the perfect actress to drop into the role. We first meet Miss Withers when she brings her students to an aquarium on a field trip. She casually trips a fleeing purse snatcher and lectures her students to "never try to evade the law with an umbrella between your legs." Like most amateur detectives, Miss Withers is pretty much a magnet for crime. A few minutes after foiling the purse snatching, she witnesses a body being dumped into the penguin pool. Well, you can't expect Miss Withers to witness a crime and NOT voice her own opinions about it--especially after its discovered that a hatpin taken from her is the murder weapon. Soon, she and the equally acerbic Inspector Piper are defacto partners in solving the crime. And it will take some solving--there's at least three suspects with means, motive and opportunity. Miss Withers, though, might just have an idea for trapping the killer into giving himself/herself away. It's a fun film, balancing the comedy with a good mystery plot. Oliver really was tailor-made for the role and James Gleason (as Inspector Piper) plays off her perfectly. But this won't be the last time Miss Withers will be called upon to solve a murder--which is a good thing as the world really doesn't have a sufficient supply of elderly women who solve crimes. Oliver will appear in two more films in the series (leaving the role when her contract with RKO expired). We'll take a look at those other two films soon. My favorite Batman stories come from the 1970s. It is, by golly, the Bat-Decade. Denny O'Neil and Neal Adams would be my (arguable) pick for the best writer/artist combination, but there were a number of others doing great work during that decade. For instance, Batman #317 (November 1979) was written by Len Wein and drawn by Irv Novick, who had a clean and dynamic look to his pencils. It's a Riddler story--and there's a way in which Wein writes the Riddler that is, I think, key to properly understanding that character. 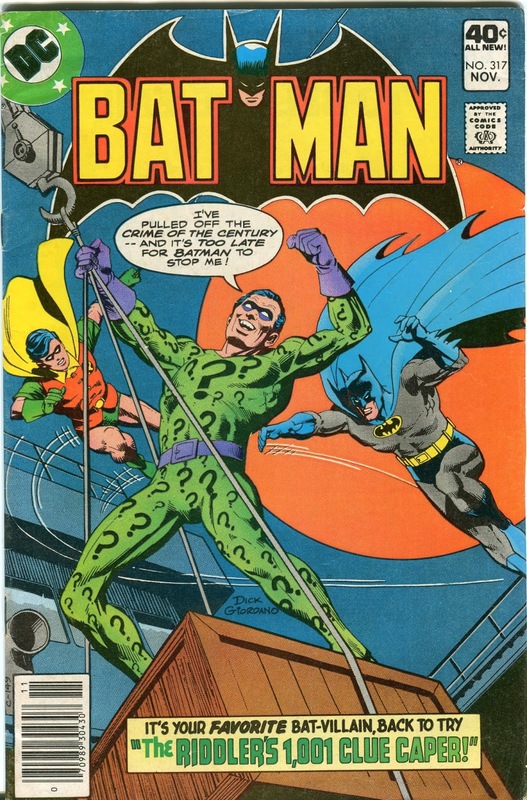 The Riddler's gimmick was, of course, riddles. He had an obsession he just could not overcome--he HAD to send Batman and/or the cops a riddle that, if properly interpreted, would hint at the crime he was planning. Of course, Batman would inevitably figure out the riddle and catch him, but he'd still be driven to send riddles again the next time he planned something. Which, by the way, makes me think if you were a low-level thug living in Gotham City, the best henchman job would be working for the Riddler. He leaves a riddle, but you sneak back later and remove the riddle before Batman sees it. The Riddler is happy because he commits his crime without interference and thinks he's outwitting the Cape Crusader at last. You get your cut of the loot and everybody's happy. But I digress. The thing I liked about the Riddler was that he was not insane or a maniacal killer. He had his one mental flaw--and admittedly it was one heck of a flaw. But he wasn't nuts. When he was caught, he was sent to prison rather than the insane asylum. He certainly wasn't a nice guy and he was willing to kill if he had to, but he's not just the Joker in a different costume. It's an important distinction--one that was lost in more modern stories when the Riddler ended up getting shipped off to Arkham Asylum when he was caught because he'd driven so far into Crazy Town. I think that was a mistake. The less-crazy version of Edward Nigma is the one that is more distinct and interesting. In "The Riddler's 1,001 Clue Caper," the villain tries to beat his obsession by mailing Batman a book of riddles. 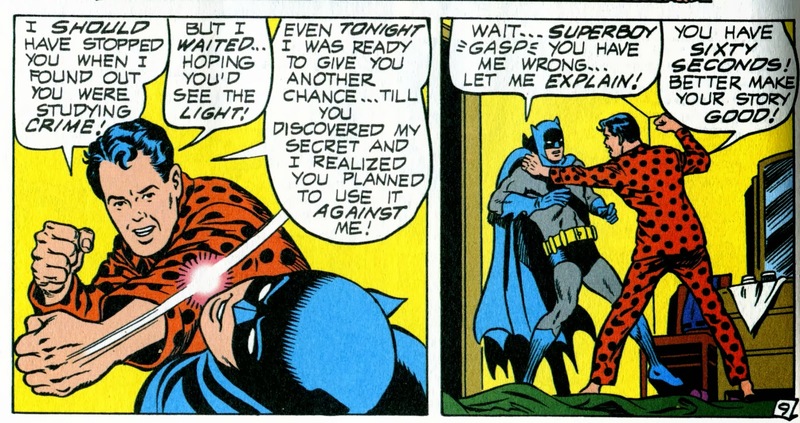 It's a clever ploy--he gets to use his gimmick, but does so in such a way that it really doesn't help Batman at all. There's no way of knowing which of the 1,001 riddles is the one that gives a clue. But Batman's not the World's Greatest Detective (well, almost) for nothing. He and Robin simply start with the riddle book (stolen from the prison library) and use basic detective leg-work to figure out what the villain is up to. So, when a series of bizarre crimes results in Riddler hijacking an illegal gun shipment, the Dynamic Duo are there to catch him when he tries to sell the weapons. I love that aspect of the plot. All this leads to the moment in which we see that Len Wein really does get the Riddler. 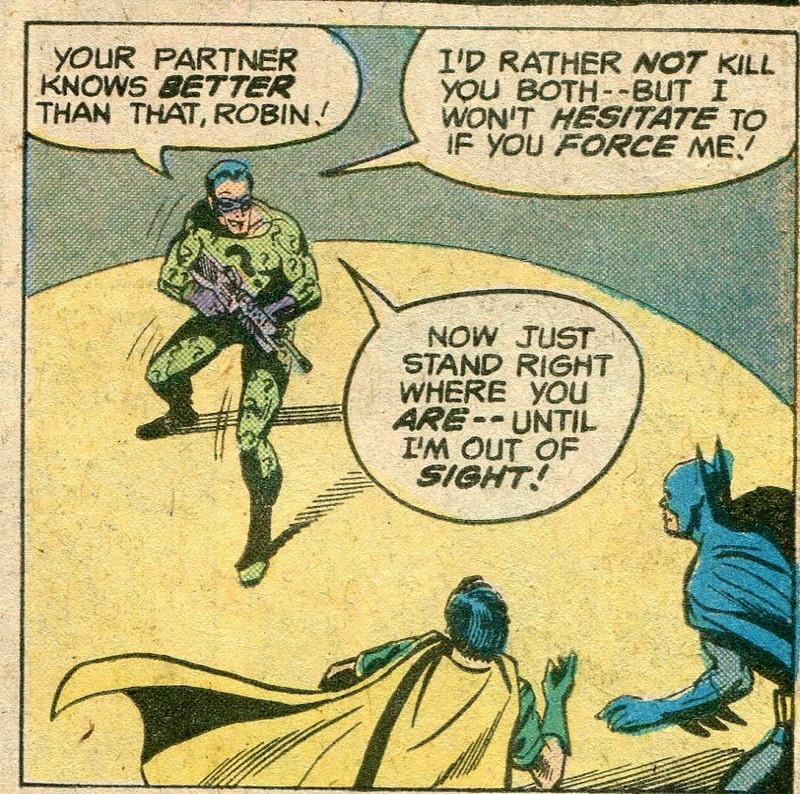 At one point, he's pointing an automatic rifle at Batman and Robin, saying "I'd rather not kill you both--but I won't hesitate to if you force me." See? He's NOT just the Joker in another costume. When written properly, he really is an interesting and distinctive character. 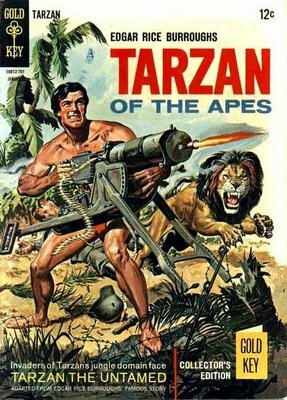 Tarzan goes all Rambo on the Germans. This is a Russ Mannning adaptation of Tarzan the Untamed, the 7th Tarzan novel. Tarzan thinks poor Jane has been killed by the Germans during the outbreak of the First World War, so you really can't blame him for being annoyed. 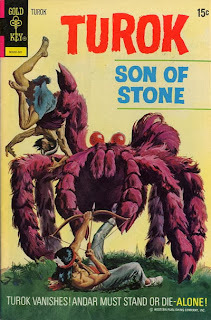 Edgar Rice Burroughs actually wanted to kill Jane off for real in this novel, thinking that he needed to free the Lord of the Jungle from domesticity so that he could go off on adventures. Editorial decree saved Jane's life and Tarzan managed to get in quite a bit of adventuring anyways. Eldery Parsley Smith lies about his Civil War experience, lies about his rank and even lies about his Mexican War experience. So when he claims the new banker is planning on absconding from Dodge City with the deposits, there's really no reason at all to believe him. Visit Mercury and Go Insane! 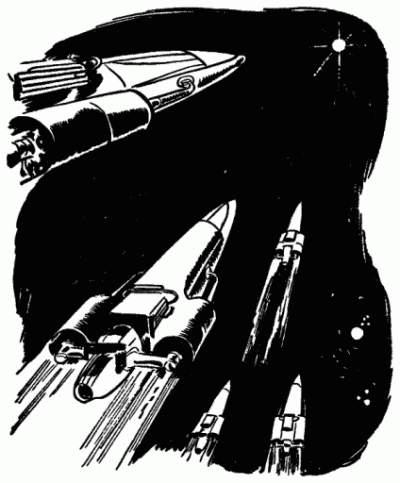 When we visited Leigh Brackett's version of the Solar System a month or so ago, we spent some time in the swamps of Venus and aboard a space ship populated by space gypsies. But just about every planet in Brackett's Solar System is a source of adventure. 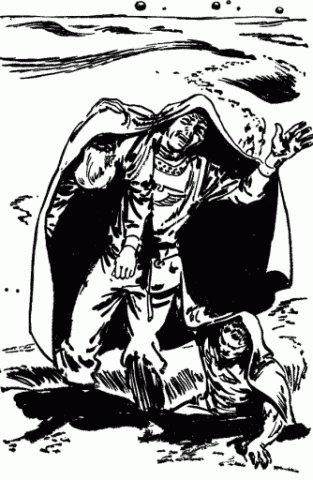 "Demons of Darkside," first published in the January 1941 issue of Startling Stories, takes us to Mercury. And Mercury is a planet that is quite likely to kill you--if it doesn't drive you insane first. But Barry Garth has to go there. He's wanted for murder and the woman he loves is about to be executed for that same murder. There is just one person who has the information that can prove their innocence. But this person is probably the murderer. Also, the guy's space yacht just crashed on the dark side of Mercury. No one has ever come back alive from Darkside. Or so everyone thinks. When Barry steals a salvage ship in a desperate attempt to find the wrecked yacht, he learns that at least one person has returned from Darkside alive. But that person left his sanity behind and now stays perpetually drunk while screaming sentences such as ""Ye thought ye had me once, ye black demons of hell, but I cheated ye!" Barry has no choice,though--either he finds the wrecked yacht along with evidence to clear himself and his girl, or the poor girl will be executed. Besides, all that talk of demons must just be the ravings of a madman. Barry reaches the Darkside, only to discover that the "demons" are indeed real. "Demons of Darkside" is a nifty little horror story--steadily building up tension and making Barry's encounter with the "demons" a truly creepy experience. The eventual payoff--involving the identity of the demons and the resolution of Barry's plight--is effective and satisfying. This is one of four stories set in Brackett's Solar System that take place (in whole or in part) on Mercury. We'll be taking a look at the remaining three over the course of the next few months. In the average issue of Turok, Son of Stone, Turok is the main protagonist with the younger Andar following his lead. This makes perfect sense, of course. Turok is the title character, the older of the two and was cast as Andar's teacher/mentor/surrogate father fairly early in the series. 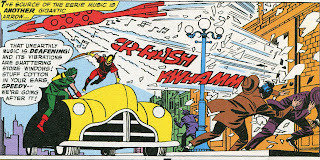 But every once in a while, Andar would get to demonstrate that he was no slouch in the hero department as well. 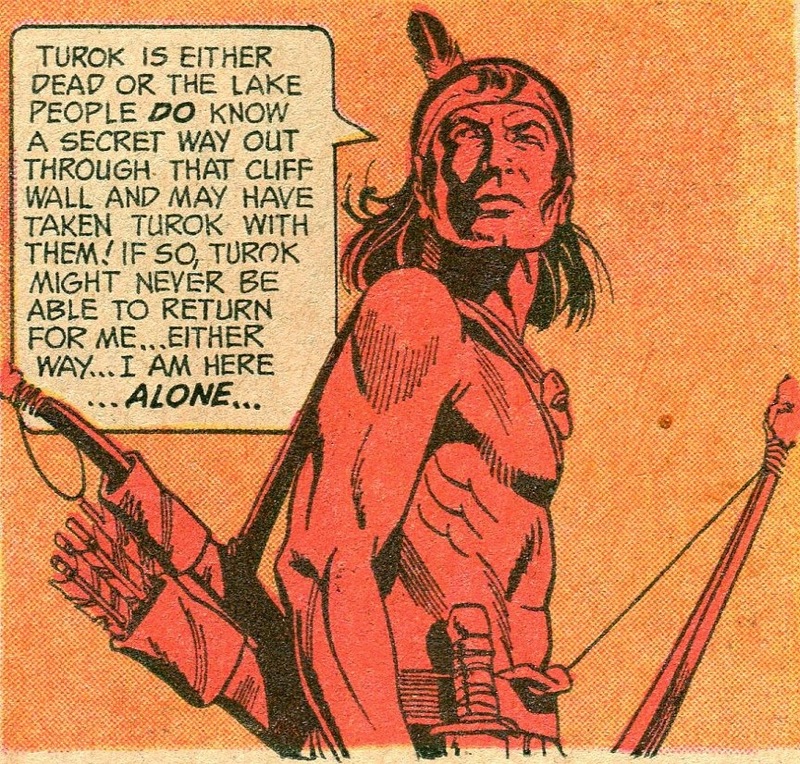 In Turok #82 (January 1973), for instance, Turok goes missing early in the story. Andar is completely on his own. This happens when the two Indians come across a deserted village on the side of a lake. When Andar is knocked after a tussle with a lake monster, Turok is captured by someone. Andar is on his own with no idea what happened to his friend. He meets a tribe of murderous nomads and discovers they had enslaved the inhabitants of the lake village. 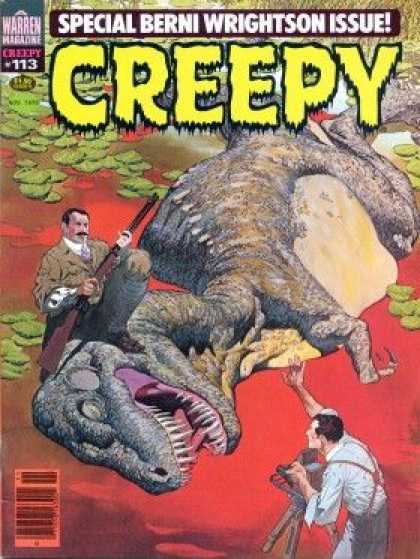 But the Lake People had fled--perhaps taking Turok with them. Andar can't know for sure. The witch doctor of the nomadic tribe wants to kill Andar, but a demonstration of fire-making and the killing of a dinosaur with a poisoned arrow actually gets Andar the witch doctor's job. 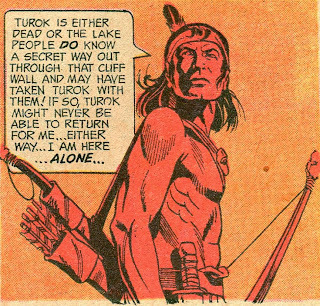 That night, the Lake People return--led by Turok who is hoping to find Andar. 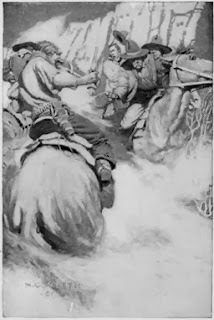 In the ensuing battle, the two Indians flee and resume their search for a way out of the lost valley. This is yet another example of the solid storytelling found in so many Gold Key comics from that era. The art by Alberto Giolitti is a lot of fun with several great action sequences. It was nice to give Andar his day in the spotlight and watch him demonstrate the level of courage and intelligence that Turok had been showing him for so long. We never do find out who wins the fight between the Lake People and the nomads, though. As a side note, I used to be critical of a lot of Dell and Gold Key's interior art--and have even knocked it a few times on this blog in the past. But as I read or re-read a lot of Dell/Gold Key stuff with the intention of writing about it, I'm realizing that the art is usually good and often excellent. I'm not sure where my original prejudice against Gold Key art came from--perhaps the superb painted covers they used gave me skewed expectations for what was inside. But nowadays I rarely if ever see anything wrong with the company's pencils. One of Berni Wrightson's finest illustrations. Here, once again, is a link to my Encyclopedia Britannica contributor page. From there, you can now see two more articles I wrote--one on DC Comics and one on Marvel Comics. That makes six altogether. Yes, I agree with all of you. I am indeed awesome. It's bad enough when the ghost of Captain Kidd sabotages the Metropolis subway system. But when the ghosts of the Jesse James gang robs a bank, poor Perry White's blood pressure really goes through the roof. This just might be a job for Superman. This is the first episode of an 11-part serial. You can download the rest of the story arc HERE. But remember--REMEMBER--it is a mortal sin to listen to more than one chapter of a serial per day! 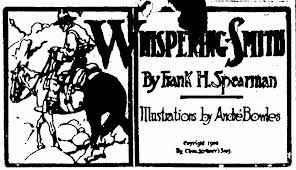 Last week, we looked at the 1906 novel Whispering Smith, which was made in a movie five times between 1916 and 1948. The last film, which starred Alan Ladd, seems to be the only one available to watch. But that's okay, because it's a really outstanding movie. The differences between the book and the movie are interesting. As one would expect, a lot of the supporting characters are eliminated or have their roles in the story reduced. Most notable in this is railroad supervisor George McCloud. In the novel, he's pretty much a co-protagonist. In the movie, he's very much a supporting character. His love interest, Dicksie Dunning, vanishes completely. The most notable difference is how the movie handles the villain, Murray Sinclair. In the novel, he's pretty much already a lost cause. But here he's still close friends with Smith and still living happily with his wife Marion. The movie opens with Smith taking out a band of train robbers, but he's wounded in doing so. His convalescence is at Sinclair's home, allowing the movie to establish their friendship (and show us that Smith is also in love with Marion--though as in the novel he's too honorable to follow up on this). Sinclair has his faults, but he's not an out-and-out villain quite yet. Even when he loots cargo off wrecked trains, he does so because this is considered the traditional thing for railroad workers to do and he doesn't really think of it as stealing. But when this costs him his job, he hooks up with an outlaw gang and begins his true moral decline. 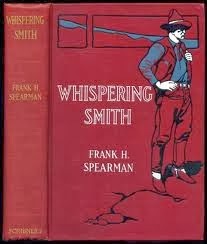 Even so, Whispering Smith tries to help him, even offering to allow him to leave the territory without being arrested. At Marion's urging, Sinclair is ready to do so. But then a man is killed during a train robbery and its now too late to turn back. It's an interesting and effective twist on the characters from the novel--using pretty much the same personalities and backgrounds, but turning the story into a human tragedy centered around Sinclair. Ladd gives a typically strong performance as Smith, while Robert Preston is very good as Sinclair. Preston eventually became synonymous with con artist Harold Hill from The Music Man, so it's a lot of fun to watch him play the burly, quick-tempered Sinclair. The movie seems to have moved the action back in time a decade or two. The novel has telephones and a smattering of electric lights. The movie is set more solidly in what we commonly think of as the Wild West, with nary a phone line in sight. There's some magnificent location photography, several excellent action scenes and, of course, lots of cool trains. Another difference between book and film: Smith's first name is changed from Gordon to Luke. I have no idea why, but there you have it. There's one thing that both the movie and the novel have in common that I simply love--both versions of the story completely respect the sanctity of marriage. Both novel Smith and movie Smith are in love with a married woman, but both Smiths instantly and completely reject the idea of following up on these feelings. Neither Smith will dishonor a good woman by suggesting she be unfaithful. It wasn't until 1976 that Marvel Comics got into the Alternate Continuity business in a significant way. This is understandable. When DC did Imaginary Stories in the 1950s/60s, they already had a couple of decades of continuity to work with. 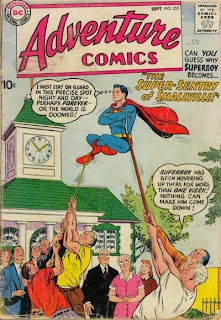 Even during the 1950s lull in superhero comics, DC continued to produce Superman, Batman and Wonder Woman books, so there was a lot of history to work with. Marvel, on the other hand, essentially started from scratch with the Marvel Universe in 1962. 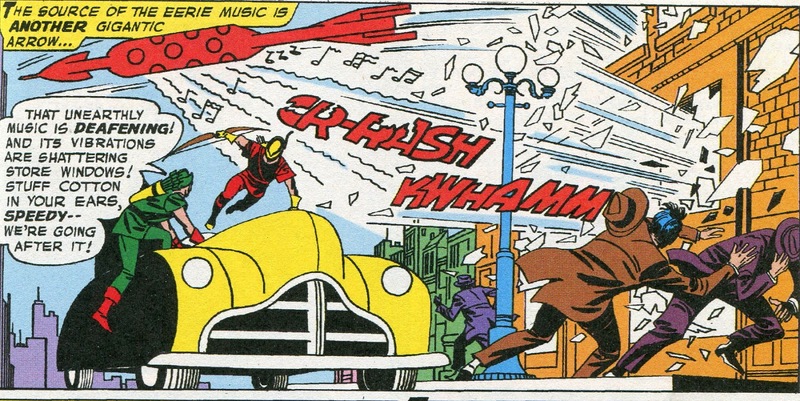 Of course, this universe had a history running back to the 1940s, but there had been a pretty significant gap during wish nothing was being added to the universe. But by the 1970s, there was quite a bit of newly established history to work with. The What If? series worked on the premise that one event within the Marvel Universe happened differently than it had in "real life," then imposed the Butterfly Effect to show how that had made everything different. For instance, the first issue (February 1977) took us back to Spider Man's first issue, in which he tried to join the Fantastic Four. What would have happened if he had joined? The answer, according to this well-constructed story, is actually rather surprising. 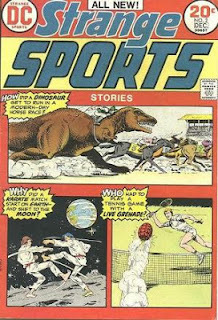 The second issue (April 1977) is the one we'll be taking a close look at. 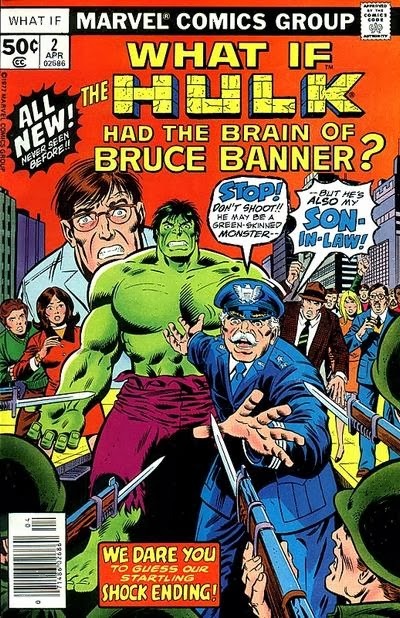 The question here is "What if the Hulk had always had Bruce Banner's Brain?" We'll get a slight continuity glitch out of the way first. 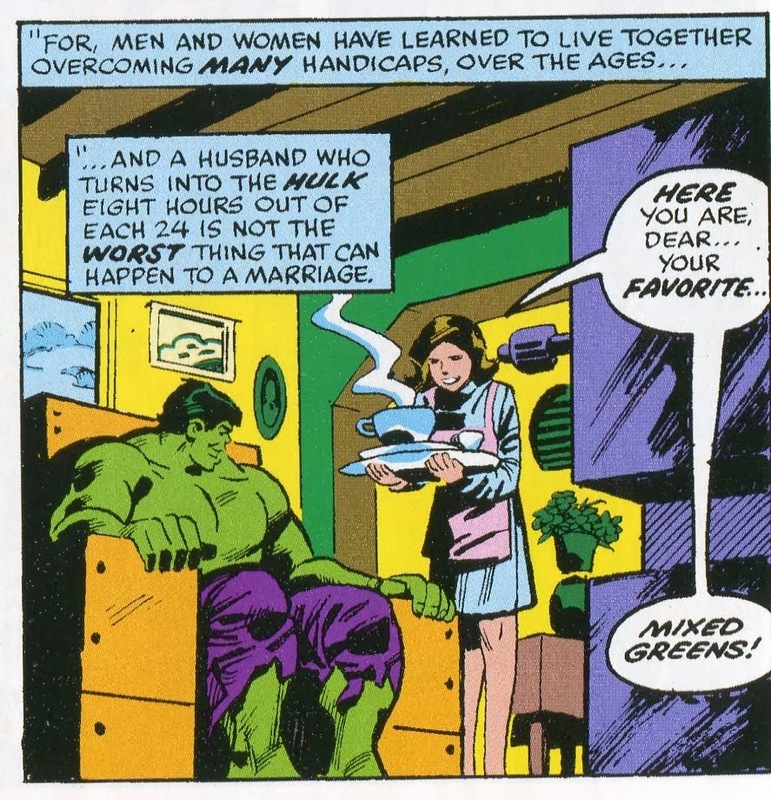 The Hulk was originally gray, but in this story he's green from the get-go. I suspect this was done on purpose, since it doesn't otherwise affect the story and it relieved writer Roy Thomas of the need to explain the color change to newer readers. Anyways, just as in real life, Bruce Banner gets caught in a gamma bomb explosion while saving Rick Jones. But when he becomes the Hulk, he retains his own intelligence and personality. At first, this is a good thing. He doesn't have to hide his identity--he makes friends with Thunderbolt Ross--and he soon marries Betty Ross while continuing his work as a research scientist. Remember that Bruce originally became the Hulk during the night, so he's able to adjust to his double life with little trouble. But then the Butterfly Effect goes into full gear. The Avengers never form. Reed Richards asks Bruce's help to find a cure for Ben Grimm. They do so, turning Ben human. Ben marries Alicia Masters and the Fantastic Four (down a member) breaks up. Professor X never forms the X-Men, because he chooses to work with Reed and Bruce instead. The story kind of glosses over who is fighting the various villains that were originally handled by the Avengers, FF and X-Men, but that's okay. There are still superheroes out there and we can assume they are still taking care of business off-screen. 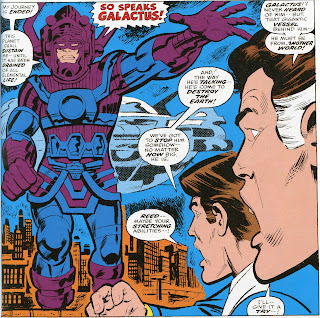 But then Galactus shows up. (There's no Silver Surfer---probably another decision to prevent the story from growing confusing or being too long.) Since the FF never met the Watcher, there's no advance warning. The excitement of the ensuing events turns Bruce into the Hulk even in the daylight, but even Hulk-level strength can't do much against the Eater-of-Worlds. But maybe strength isn't the answer. 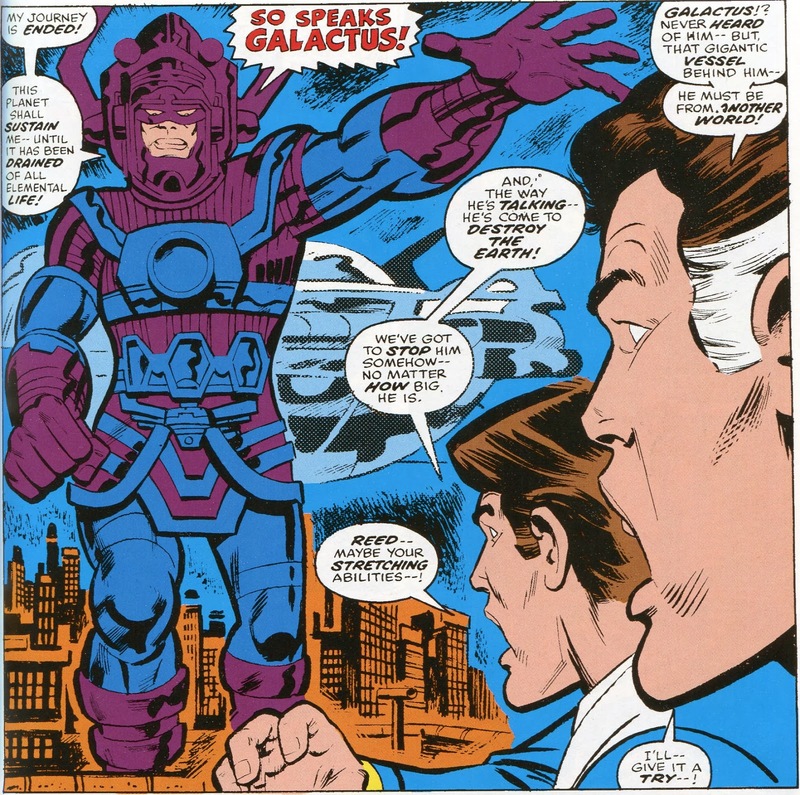 When the three smartest smarty-pants in the Marvel Universe put their heads together, they just might come up with a way of defeating Galactus. They do, of course, but there's a tragic consequence to their actions. Residual energy from their fight strips Bruce, Reed and Charles of their powers AND turns Ben Grimm back into the Thing (but now with Hulk-level strength) AND alters Ben's mind to make him a brutish monster. Soon, General Ross is put in charge of defeating Ben and bringing him in. It's a great story, with the changes in Marvel history following logically from the initial change. One interesting thing about the What If? stories (especially when compared to DC's Imaginary Stories) is how often there was a tragic twist or an unhappy/bittersweet ending. I've often thought that perhaps the writers in the Marvel Bullpen used the What If? stories to vent--to get away from the necessity of the bad guys always being foiled and the main characters always surviving. And I don't have a problem with that. I think superhero stories should--above all else--simply be fun. But angst and tragedy still have their part in any storytelling genre. As long as the stories are well-told and the tragedy dramatically effective AND as long as the regular Marvel Universe remained an over all fun place, then I'm okay with an occasional tragic What If? story. My money is on the T-Rex. Here's a link to my Encyclopedia Britannica contributor page. In addition to the articles on the Green Hornet and Doc Savage that were already published, there are now two articles I've written on the Shadow: one about the pulp magazine character and one about the radio character. A fast-moving and fun story about a race to recover an Incan treasure. There's a great twist at the end. best-selling novels of 1906. It's also been filmed a number of times, with the first version produced in 1916 and the last in 1948. 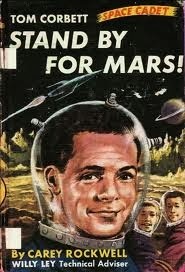 There was also a short-lived television series starring Audie Murphy made in 1961. Well, I've now read the novel and, by golly, it's a lot of fun. It's set in the turn-of-the-century Old West, where the resourceful George McCloud is a new railroad supervisor based in the town of Medicine Bow. One of the first things McCloud has to do is fire work-gang leader Murray Sinclair, because Sinclair refuses to give up his "right" to loot valuables from a wrecked cargo train. This causes a lot of trouble. Sinclair is popular with his men and with many of the ranchers in the area, many of whom think Sinclair is being treated unfairly. That makes McCloud unpopular enough to pin a target to his back. And Sinclair does not otherwise go quietly into the night. It's not long before one train is wrecked and another is robbed. That Sinclair is responsible is obvious, though no legal proof exists. All this has brought Gordon "Whispering" Smith into the picture. He's the railroad's trouble-shooter, a job that largely involves making sure outlaws and thieves do not interfere with railroad business. Over the course of the story, this means facing down a known killer who is after McCloud, arranging a raid of a canyon used as an outlaw hideaway and organizing a posse to track down Sinclair. The fact that Sinclair and Smith were boyhood friend makes the job more difficult. The additional fact that Smith is in love with Sinclair's estranged wife Marion makes it even more difficult. But it's a job that's gotta be done. I really enjoy Spearman's prose. There's a lot of understated humor present and at times the story almost give the impression of rambling aimlessly. But it never really rambles at all--the events and the characters are all laid out for us clearly and the plot unfolds logically. We are given an often vivid impression of the time and place in which the story is set. The characters are great as well. George McCloud and his love interest--the pretty and very brave Dicksie Dunning--both get their respective Crowning Moments of Awesome, while Whispering Smith proves to be brave, smart, resourceful and compassionate. It's impossible not to like and admire Smith. There's two related incidents in the book that really define his character. 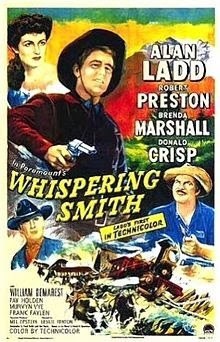 When a compatriot of Sinclair kills a rancher and orphans a ten-year-old boy, Smith takes it on himself to comfort the boy and see to his future welfare. But a few chapters later, when he mortally wounds a murderer, he also takes it on himself to give what comfort he can to the dying man. Nothing Smith does or says excuses the murderer's actions--but Smith is not capable of turning away from a suffering man. to panic when the bullets start to fly. It is a terrific novel, telling an exciting story while often giving the impression that you are listening to a grizzled Old-Timer telling you the tale while you are sitting around the fireplace. Anyways, just as I was finishing the book, I was reminded that I actually own the 1948 film. I bought it awhile back as part of a four-movie set I found in the $5 bin at Wal-Mart, but had forgotten I had done so. I think we'll take a look at this film next week. It'll be fun to compare it to the novel. During the 1950s and 1960s, DC Comics used to do often awesome stories they dubbed "Imaginary Stories." These were tales that took place outside regular continuity--in which Superman got married and had sons; or Flash reveals his secret identity; or Lex Luthor finally kills the Man of Steel. It took awhile for Marvel Comics to jump on the "alternate continuity" bandwagon--probably because they were essentially starting fresh in 1962 and it took awhile to build up a coherent history that was worth playing with. In 1977, Marvel began to publish "What If?" 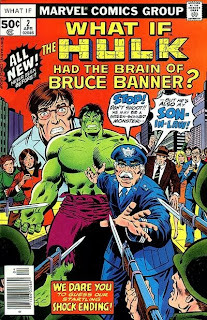 which dealt with concept such as "What if Spider Man had stopped the burglar who would have killed Uncle Ben;" or "What if Rick Jones had become the Hulk." These were fun ideas, allowing the writers and artists to play outside the normal sandbox and sometimes really surprise the readers with some unexpected plot twists. This week, we'll look at a DC "Imaginary Tale," then next week we'll investigate a "What If" story. 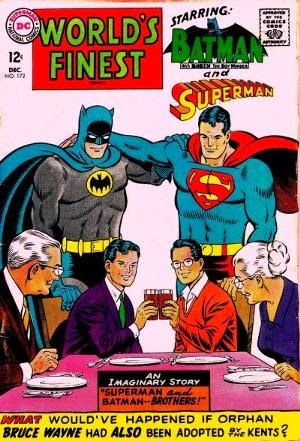 World's Finest Comics #172 (December 1967) examines the possibility of Clark Kent and Bruce Wayne being brothers. Not blood brothers, of course, since they were born on different planets. Though, come to think of it, it would be fun to come up with a bizarre explanation for how they COULD be blood brothers. 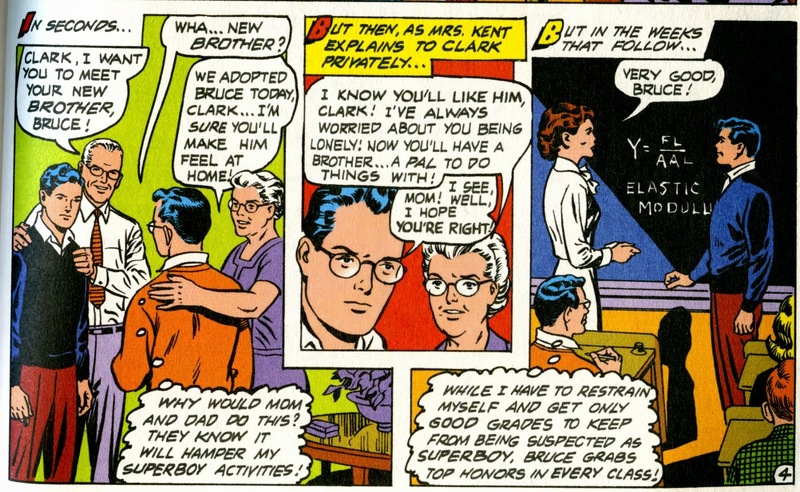 But what if the Kents simply adopted Bruce after Bruce's parents were killed by Joe Chill? Well, Clark seems a little jealous at first--after all, Bruce doesn't have to hide how smart and athletic he is at school to protect a secret identity. 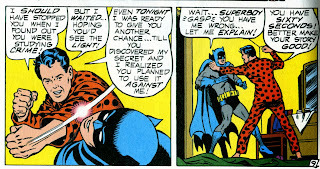 This leads Clark to assume the worst when he discovers Bruce is secretly studying criminology and designing a bat suit. Obviously, Bruce is planning on becoming a super villain. When Bruce turns 21, he inherits Wayne Manor. He, Clark and the Kents move in. 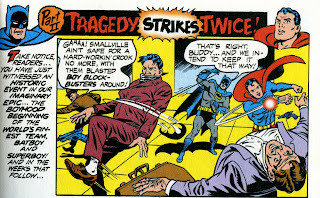 Clark gets a job with the Gotham Gazette in this reality. Lex Luthor shows up to be the brothers' collective arch enemy. There's a caption that tells us Clark and Lex never met as kids in this continuity, making me wish there'd been another page or two of story to explain why Lex still turned out bald and evil. But even so, the story remains strong. Lex lures Superman to another city, kidnaps the Kents and forces Batman to run a gamut of death traps in an attempt to save them. Curt Swan's art is particularly excellent during this sequence, showing us a Batman who has been dipped in 120%-pure Awesome Sauce has he battles past one death trap after another. When its apparent that he's going to win, Lex cheats and sets off the bomb early, killing the Kents. Bruce can't deal with the grief of losing yet another set of parents and plans to give up crime fighting. To change his mind, Clark flies him to the 30th Century, where Batman becomes a member of the Legion of Super Heroes. He can keep fighting bad guys without having to deal with too many painful reminders of his loss. Despite the awkward use of "Bat Boy" during the first half of the story, there's a lot of honest emotion generated here. Clark's jealousy of Bruce early on seems real to me, while Bruce's reaction to the death of the Kents (he's stopped from beating Lex to death only when the cops arrive and tell him to stop) conveys sincere rage and grief. Even Lex--going from arrogant to panicky as Bruce runs his death trap gamut--comes across as real. Writer Jim Shooter really is at his best here. And to be fair, what would you have called him other than "Bat Boy?" "Bat Kid?" "Bat Lad?" There's really nothing that works, is there? This novel was published in 1959, so it's not related to the 1960s TV series with the same title. I like it largely because that's a really nifty looking space ship. A band of ruthless crooks plan to board and rob the riverboat Indian Queen while it is carrying valuable cargo along the Yukon River. To cover their crime, they intend to scuttle the ship afterwards, killing all aboard. It is, of course, up to Sgt. Preston and his dog Yukon King to save the day. But they can’t save it alone. With the regular crew locked away as the Indian Queen floats into some rapids, a former riverboat pilot named Steve Ballard (who had lost his nerve after losing a boat to a hidden snag some years earlier) must pull himself together and take the wheel. Produced by the same people who made The Lone Ranger and The Green Hornet, Challenge of the Yukon offered the same high production values and expert storytelling as those other two shows. And, of course, anytime a story can logically fit something as cool as a 19th Century riverboat into a story, it’s already one up on the competition. 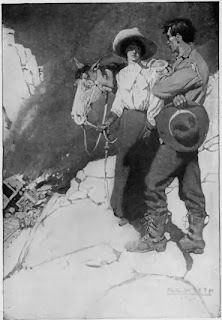 Challenge of the Yukon was basically a Western in terms of plot and characters, but its unique setting gave it an equally unique ambiance. “River Pirates” is a fine example of just how entertaining this show could be. And, of course, the unlimited budget given to radio by our imaginations means that riverboat ride through the dangerous rapids “looked” just as cool as any modern CGI effect. Tom Corbett come into existence in a roundabout way. Writer Joseph Greene authored a radio script in 1946 titled "Tom Ranger," but this was never produced. Then, in 1948, Robert Heinlein wrote the novel Space Cadet, which sold rather well. 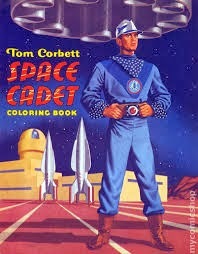 This convinced Greene to dust off his space cadet radio script, which eventually found its way to television in 1950 as Tom Corbett, Space Cadet. Tom became a pretty popular guy. The same cast of actors doing the TV show brought it to radio in 1952 and there were also comic books, novels, coloring books and a Viewmaster set. Rockwell--I'm afraid I'm not sure if the author was indeed Joseph Greene. But whomever wrote it, it's a fun book. 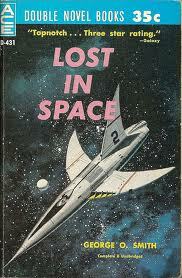 The novel tells of Tom's first few months at the Space Academy. In terms of characterization, it's fairly straightforward--Tom is a straight-arrow guy who wants to do well. One of his teammates (cadets are assigned to teams of three) is Roger Manning, who is brilliant but snotty and disrespectful. The third team member is Astro, who is already a skilled engineer but struggles with the advanced mathematics he must learn. Most of the character development comes from the three learning that they can trust each other and discovering what makes Roger such a jerk. These characterizations are all predictable, but they are handled competently and we end up liking the trio. 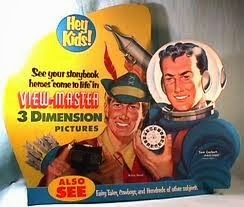 forget that Tom, Roger and Astro are able to handle complicated math, engineering and navigational problems. At one point, when Roger talks about doing logarithms in his head when no computer is available, you kind of want to smack him one for being such a smarty-pants. But you don't doubt for a moment that he can do it. The action scenes are also handled well. While out on training maneuvers, Tom's ship answers a distress signal. What follows in quick succession are rescuing passengers off a damaged ship before it blows up; doing make-shift repairs on the ship; crash-landing in the Martian desert; surviving a three-day sandstorm; digging their way out of the wrecked ship without drowning in powdery sand; and walking across the blistering hot desert with insufficient water. It's well-told and exciting stuff, with the emphasis on the necessity of teamwork and the need to think & act intelligently. Everything Tom and his team do makes sense, as they take carefully calculated risks before acting to first save others and then save themselves. Rockwell--whoever the heck he was--creates likable characters and has them acting in believable ways. The writer, I think, believed in the ideals he was presenting and his effective prose is combined with this sincerity to give us a classy and entertaining story. During Jack Kirby's time at DC Comics during the late 1950s, he often took what work he could get. (There was a downturn in the industry at the time, so there was a lot of competition.) So when editor Jack Schiff asked him to draw Green Arrow stories, which ran as back-up features in Adventure Comics and World's Finest Comics, he took the job. Kirby had never read a Green Arrow story and, when he took a look at them, thought they were unremarkable. 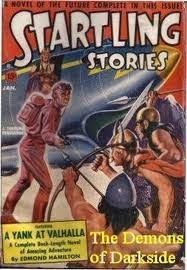 So he began to introduce a more overt science fiction feel into the tales. This didn't last long--Kirby soon left DC after a dispute with Schiff and the G.A. stories reverted to a less fantastic tone. But, gee whiz, it was fun while it lasted. Kirby drew a total of 11 stories, while also writing, re-writing or co-plotting them in his effort to send them off in a more imaginative direction. What he accomplished isn't his best stuff--he needed characters like the Fantastic Four, Thor, the New Gods and Kamandi to really allow his imagination to soar. But he still told some clever and entertaining stories. My favorite of the batch is a two-parter (a rare event in that day) from Adventure Comics 252 & 253. 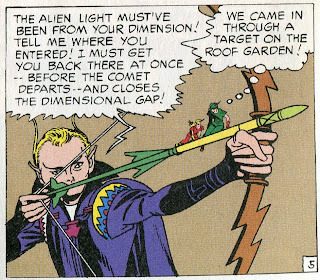 Part 1 is "The Mystery of the Giant Arrows" and involved--well--some mysterious giant arrows that appear out of nowhere and raise havok. 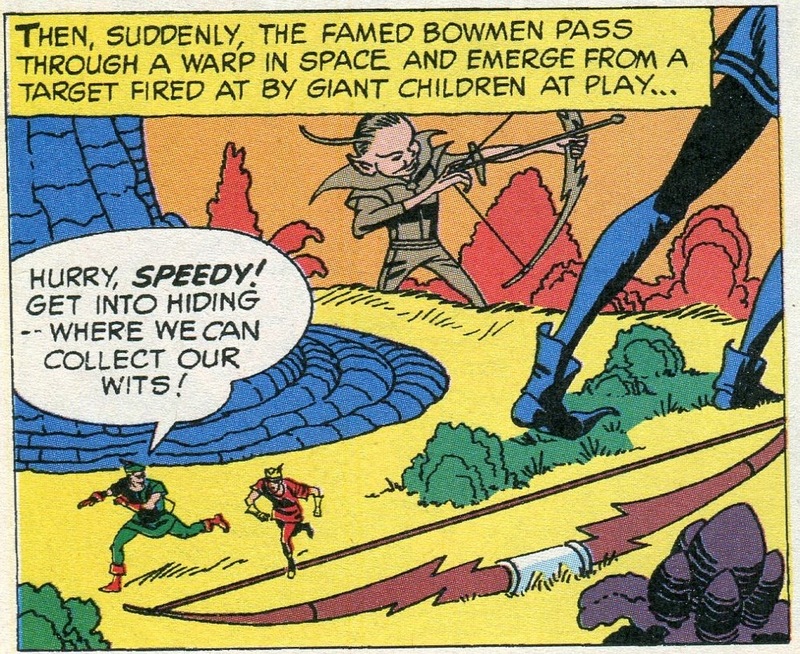 Green Arrow and Speedy investigate only to be accidentally pulled through a dimensional rift. That brings us to Part 2: "Prisoners in Dimension Zero." Trapped in a dimension populated by giants, Ollie and Roy discover the mystery arrows were being fired by some snotty kid with a toy bow. Not long after that, they discover that this dimension also has a Robin Hood-esque hero--called Xeen Arrow. The tiny heroes manage to help Xeen Arrow foil a robbery. Deducing that a comet that recently passed by opened the rift between dimensions, Xeen Arrow straps G.A. and Speedy to a Xeen-sized arrow and fires them back through the rift just before it closes. But the basic plot and Kirby's visuals make this a lively and enjoyable tale. I especially like his Zero Dimension giants; they're pretty much just giant humans, but slightly odd facial designs and a subtle distortion of bodily proportions give them an appropriate alien-esque aura. And when all else is said and done, riding a giant arrow through a dimensional rift is simply awesome.